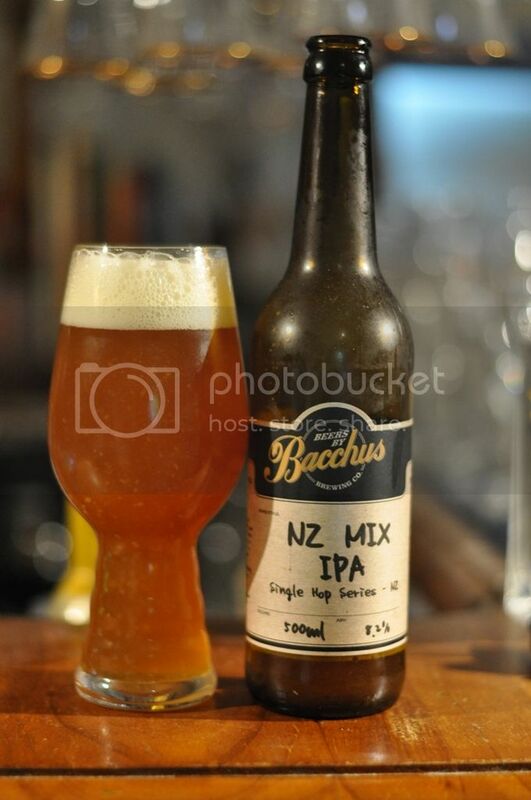 Hopefully you all enjoyed Part One and Two of my look at Bacchus Brewing Co.'s New Zealand Single Hop IPA pack. If you haven't already read it you can find them here and here. If you can't be bothered clicking through to that here's a little bit about the pack, taken from the previous reviews. We've looked at most of the big hops in the New Zealand beer scene so far in this series, however we've saved one of the biggest for last; Motueka. 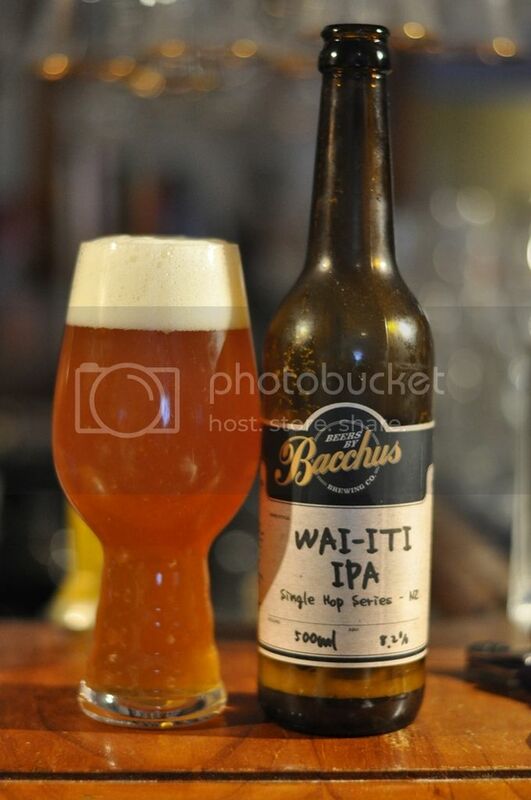 In this review we are going to look at the aforementioned Motueka, Wai-iti and finish off with the NZ Mix IPA - an IPA with all the Single Hops sampled so far in it! I decided to start off with Wai-iti, a hop I previously knew very little about. My googling has revealed that it's a low alpha acid variety which should impart plenty of citrus. 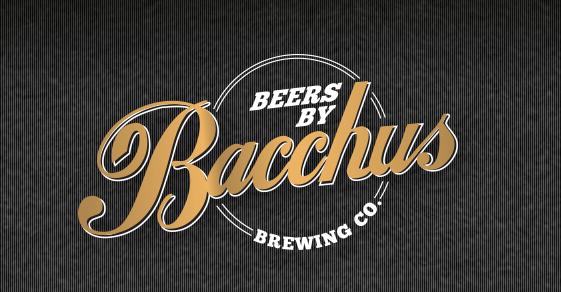 There's also some talk about it having to be used in large quantities to impart much flavour, so I'm interested to see what Bacchus have done. The flavour really intrigued me; I can't remember having quite as much lime flavour in an IPA. It was almost sour, yet was clearly bitter. (Hopefully that makes sense...) There's also other citrus fruit flavours with lemon and grapefruit noticeable as well as some mandarin that I wasn't expecting. 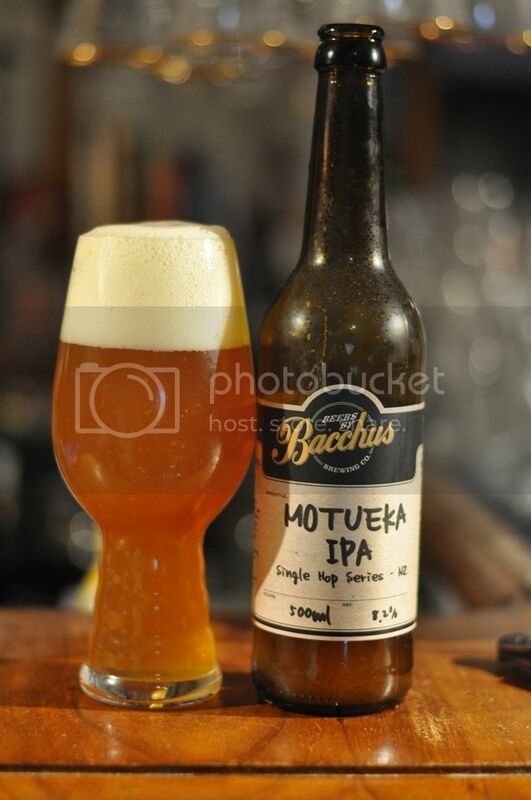 Motueka is a hop that most Australian/New Zealand craft beer drinkers would be familiar with. This is a hop that I've had in beers a lot before, I've even had a BrewDog IPA is Dead (Single Hop) with Motueka in it. It's normally packed with tropical fruits, something I'm looking for at the moment, so I'm hoping Bacchus have delivered. This was unfortunately the first Bacchus Single Hop beer that let me down a little. There was plenty of the tropical fruit flavours that I was expecting; it was almost like a fruit salad. In one aspect this was good, on another it led to it being a little too sweet. The final beer in the pack was the NZ (New Zealand) Mix IPA. This beer was a mix of the 8 hops that have been used in this series to date. Namely; Rakau, Nelson Sauvin, Wakatu, Waimea, Pacific Jade, Riwaka, Wai-iti and Motueka. Judging by most of these beers this will also be an excellent beer. I thought that the NZ Mix IPA really wrapped up the series well. The hop bill mentioned above really epitomized the main themes of the hops in this series, and I suppose New Zealand hops as a whole. It packed plenty of citrus and tropical fruit flavours as well as excellent bitterness. It may have liked the pine of many of the top ranking IPA's but it was very good for those who appreciate the other key elements of IPA's. This was a great pack that would appeal to either seasoned drinkers or people just starting out on their craft beer journey. To Ross and his crew; great job guys, keep brewing new beers - and I hope to see more Single Hop IPA's in the future, an Aussie edition maybe? In the meantime guys, keep your eyes peeled for offerings from these guys - they are brewing some great stuff!